But the perspective is really interesting. I think you did it correctly with the sun light. So that diserves a fav i think ^_^ Because it must have been hard to make it in the right place. I'm very impressed that you can do something so nice with a scan from that perspective. Really great work! This is a really nice and fresh piece with plenty of light and plenty for the eye to focus on. Nice work. I like so much this fresh vision! and the clouds are wonderful! I agree with kara, it was a difficult perspection to work with! wow susan-chan...such a cheerful wall..
And I luv the perspective.. Pretty good old wallpaper. I like the background for this. The scan is clear and good. +Fav. Owww! Very pertty Susan-chan. :) I love the scan and the background with the clouds look very pertty. Nice job and adding to favs! Fantastic wall! 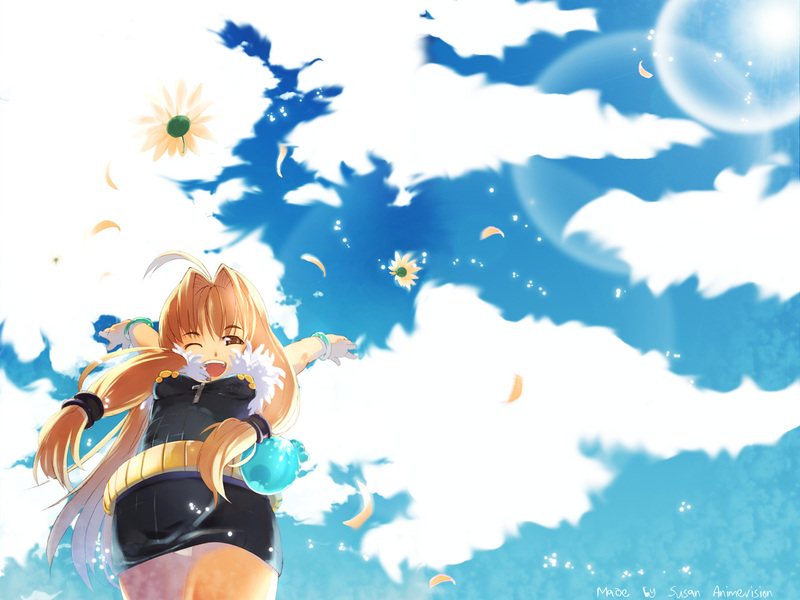 ^^ I love the perspective, it is so great ^^ And those clouds are so lovely made! and those flowers too ^^ It creates a feeling of happines and energy ^^ I like it ^^ and the scan has lovely happy expression ^^ . Great job! guao, how nice is the bg!! !, l love the clouds!! it goes to my computer!! Enough clouds? Nahh! I like the piece. It feels like you're laying on the grass looking up into the sky. wow! I love it ^^ The clouds look rather fake >< But that makes it unique! ggggreeeeeeeaaaaaaatttt JOB, buddy!!! such a preatty wallpaper, it somehow makes me feel good and happy. weee you've got plenty of ragnarok wallls! and they are so cool! mel ove this one i like the sky and the clouds! plus the scan fits the bg! love the flowers too!+fav!